Until recently, Oat milk is one of two popular alternative milks I hadn't tried. The other is rice milk. The reason is that Oat milk tends to have more calories than other alternative plant based milks. As I drink a lot of tea, coffee and other lattes during the day, it all adds up. But after noticing a new Oatly Skinny alternative milk with fewer calories than the regular version, I thought it about time I tried it. 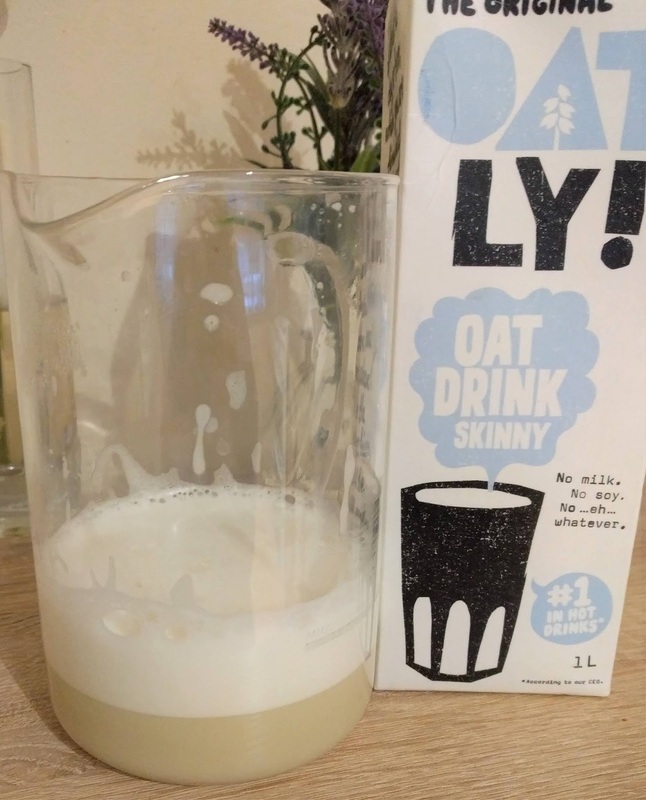 This milk is called Oatly Drink Skinny and it has 37 calories per 100ml. Oatly comes in 3 varieties: Whole, Semi and Skinny, there's also a foamable barista version. The whole version has 57 calories per 100ml (2.8% fat), the semi has 46 calories (1.5% fat) and the skinny has 37 calories (0.5% fat). All 3 contain 10% oats. The calorie difference appears to be due to the fat content provided mainly by the addition of rapeseed oil. Fortunately this oil isn't included in the Skinny Oatly. My first taste of Oatly was on its own and cold straight from the fridge. It was quite a surprise as it was so different to my usual nut milks or soya. My first thought was this was too weird, but I persevered and really tasted it. It was then that I realised I was tasting porridge! And I love porridge. I think you'd need to enjoy porridge oats to like the taste of this milk as, unsurprisingly, it has a distinct oaty flavour. However, I really liked it and I wasn’t expecting to. Next I tried heating it to make a hot chocolate. Despite the fact this dairy alternative has only 0.5% fat, it frothed up surprisingly well after heating. Although it altered the taste of my usual hot chocolate, it was still very nice. I’ve tried it in a matcha latte, and although nice and creamy, I found it a bit too overpowering for the delicate taste of the matcha. I drink regular black tea with cashew milk and tried drinking it with Oatly Skinny. Again, the oat drink flavour was noticeable but didn’t spoil it in the way I find coconut milk does. 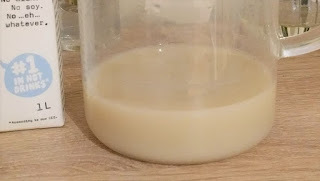 So another tick for oat milk. Oatly has a creamy consistency despite the low fat and it’s definitely one I'll buy again. I’ve also re-examined the nutrition of some other brands for comparison and noticed that Rude Health do an organic version which has only 35 calories, so that’s on my list. I've just found this organic long life version of Oatly which also has 37 calories per 100ml. It tastes just the same but because it's organic, it doesn't have the added vitamins and minerals which is found in the skinny version. You can find Oatly plant based alternative milks in most supermarkets and the Skinny version was found in a branch of Waitrose - in the chilled milks cabinet. The Oatly organic is also found in Ocado and Sainsbury's. Oat Base (Water, Oats 10%), Acidity Regulator (Dipotassium Phosphate), Calcium Carbonate, Calcium Phosphates, Iodised Salt, Vitamins (D2, Riboflavin and B12). 37 Calories, 0.5g fat, 0.1g saturated fat, 6.6g carbs, 4.1g sugars, 1.0g protein, 0.8g fibre, 0.10g salt. Vitamin D 1.5ug, Vitamin B12 0.38ug, Potassium 151mg, calcium 120mg. 37 Calories, 0.5g fat, 0.1g saturated fat, 6.7g carbs, 4.1g sugars, 1.0g protein, 0.8g fibre, 0.11g salt.